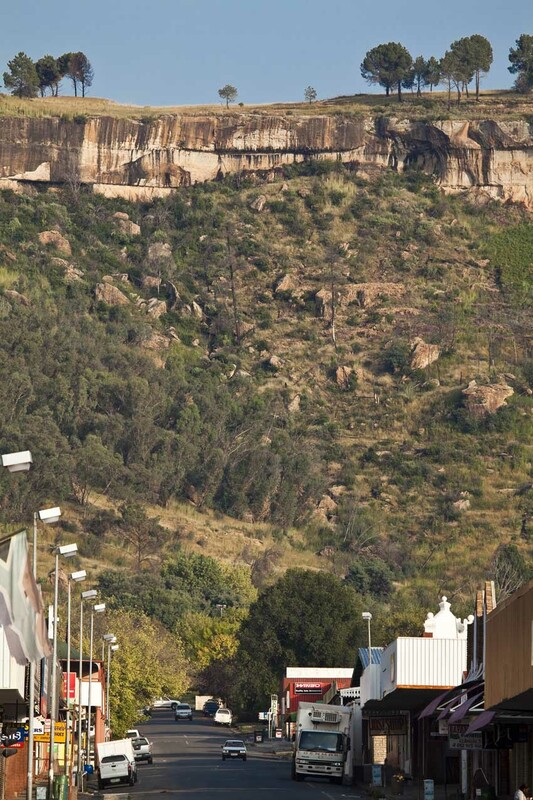 The Brandwater Basin begins at Golden Gate and runs parallel to the Lesotho border, including Clarens and Fouriesburg, ending near Ficksburg. As the British forces advanced into the Orange Free State Republic in the South African War (Boer War) in 1900, having at last got past the Boer defences at Magersfontein and elsewhere, the Boer commandos went into hiding in the Basin. The British Army blocked the passes from the Basin, and captured the Boers, with the exception of General De Wet's commando, which managed to escape undetected in the dead of night. Many thousands of Boers surrendered under the command of General Prinsloo, the action being played out at Surrender Hill between Clarens and Fouriesburg, and were sent into exile in Ceylon (Sri Lanka) and the West Indies. As we travelled the national road along the basin, I wondered how much had changed in the intervening one hundred and ten years. Obviously agriculture had made a large impression, and farmsteads were dotted here and there. The usual power lines abounded, and long lines of exotic trees adorned the landscape. Yet it was much as it must have been as the stacks of rifles were burned and ammunition supplies destroyed while the Boers looked on disconsolately, their trusty horses being led away, wagons and oxen being commandeered into the British war effort, their black helpers and retainers dispersing aimlessly, their own futures destroyed. Many were never again to see their homes and families. There is still a sense of devastation to be felt by those who know the story. Yet, it is a most beautiful part of our country. The sandstone hills and cliffs of the Malutis are all about, bracketed by rolling plains and plateaus of grassland, punctuated with streams and wetlands each with its band of Ouhout (Old Wood) trees and scrub. It seems little-touched, and is a scenic treasure for those prepared to pause and see. 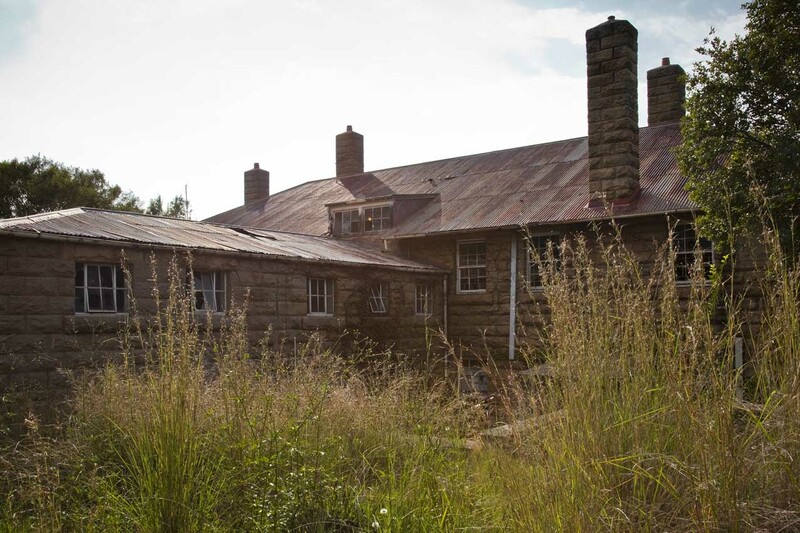 We decided to head straight for Ficksburg where we were to stay for four nights, and to venture from there as our mood dictated. It was new territory for both of us, and the Pathfinder's brakes were often tested by sudden stops to make the most of a view. After a peaceful cruise down the national road we came to Ficksburg and tried to remember the Google Map I'd downloaded and printed, but forgotten to pack. We found Die Kersiehuis (The Cherry House) with little trouble, and were immediately pleased with our blind selection. 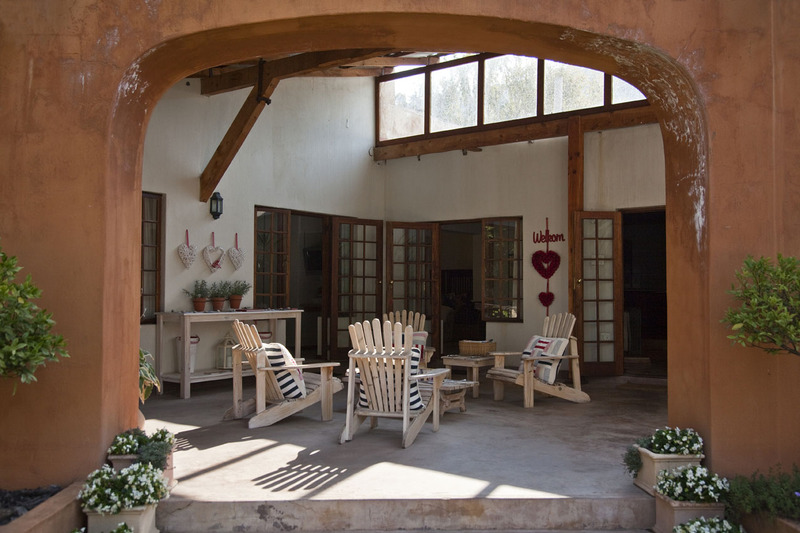 We had an early taste of our no-nonsense hostess, Ina van Jaarsveld, who turned out to be a friendly and very artistic lady who loves cooking, as we were to find out. 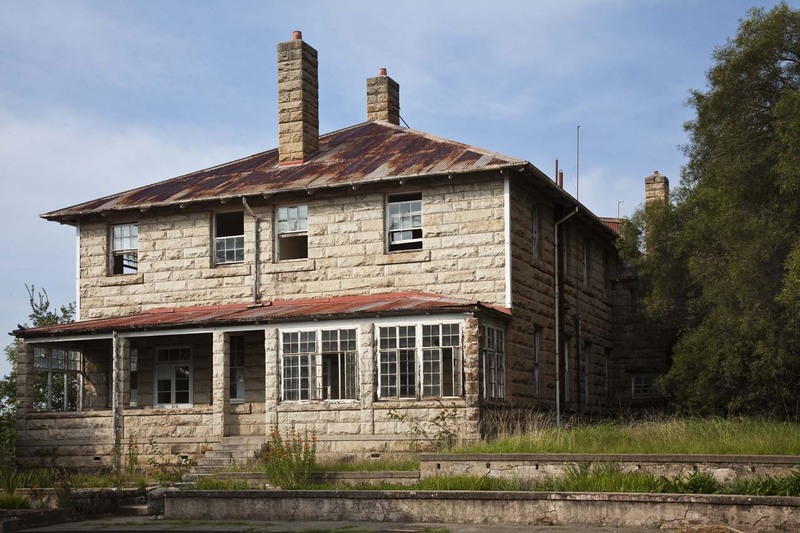 Our plan for the next day was to retrace our kilometres and take a look at Fouriesburg. Before that, though, I took a stroll around the central part of Ficksburg to admire the major buildings. 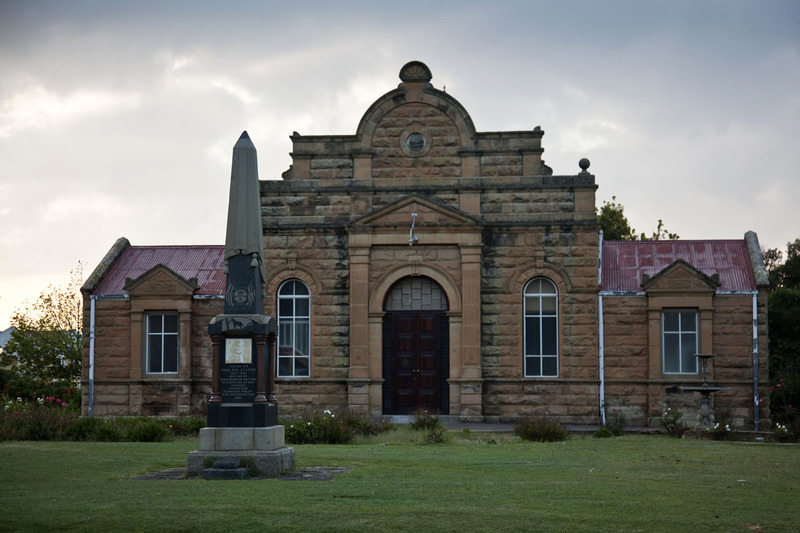 First of these was the Town Hall with a memorial tribute to General J I J Fick, founder of the town and leader of the military action against the Basuto people in 1865. 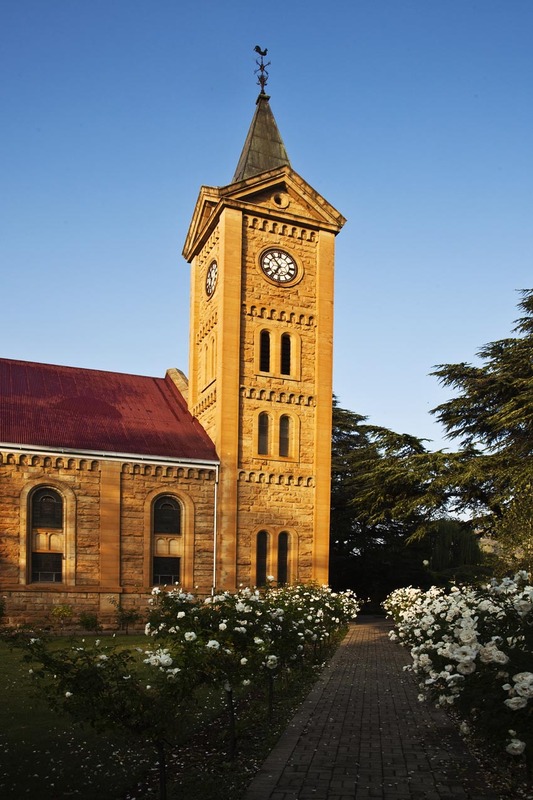 Almost all the major civic buildings and churches in this part of the country are built of local sandstone, the architectural styles varying widely. 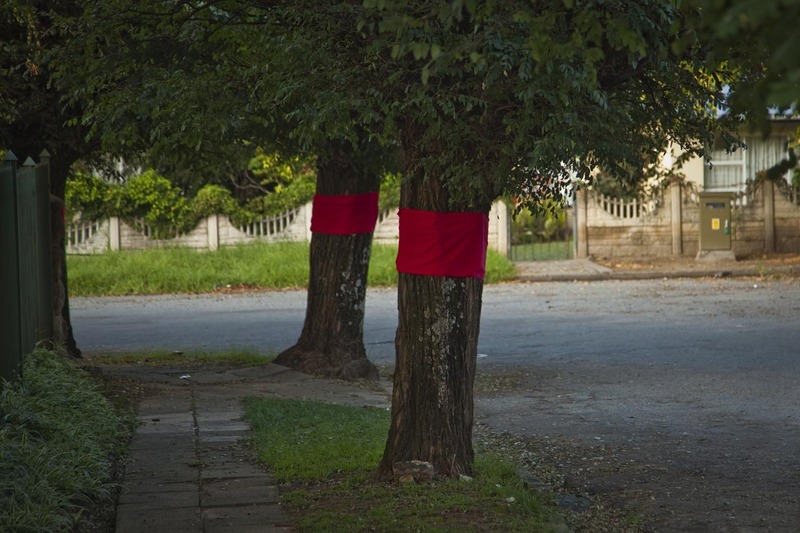 Something that caught our attention as we entered the town was the number of trees bearing bright red cloth wrapped around their trunks. Large trees, small trees and even some buildings, like the Dutch Reformed Church were part of the show. We thought it might have to do with the annual Cherry Festival although that happens in November, but Ina told us it's a celebration of Easter, the equivalent of the Roman Catholic and Anglican Lent. The church buildings, surrounded by beautifully tended gardens with pathways bordered by flowering roses, are a wonderful advertisement for the locally quarried sandstone. I wasn't able to research the history of the buildings, but that will still happen. 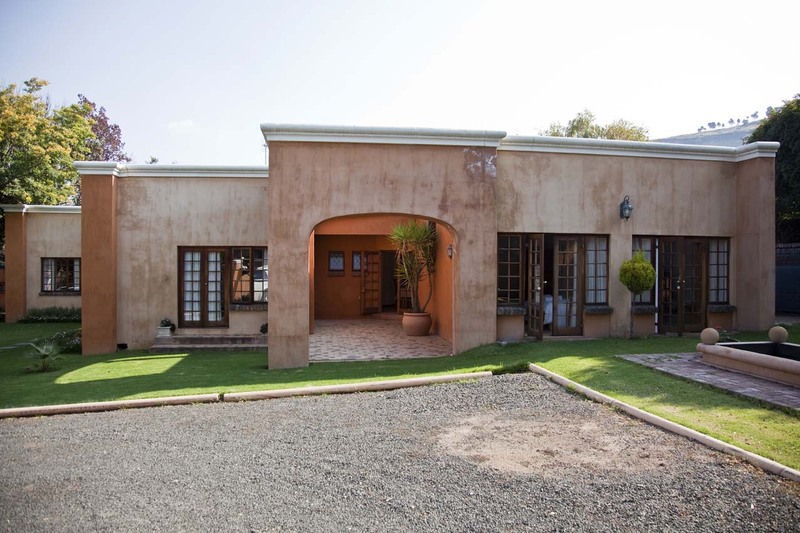 Ficksburg is a typical, bustling farming centre, a close-knit community, and is one of the major gateways into Lesotho. Terri and I had thought of driving to Khatse Dam in the Lesotho Highlands Water Project, but decided to have a closer look at the Free State. The town has a history rich in events and personalities, and, as we soon found out, in nearby surprises. The town itself is surrounded by sandstone hills, one of which has a narrow road access to the very top, but my vertigo affliction put me off trying that winding track up the cliffs. 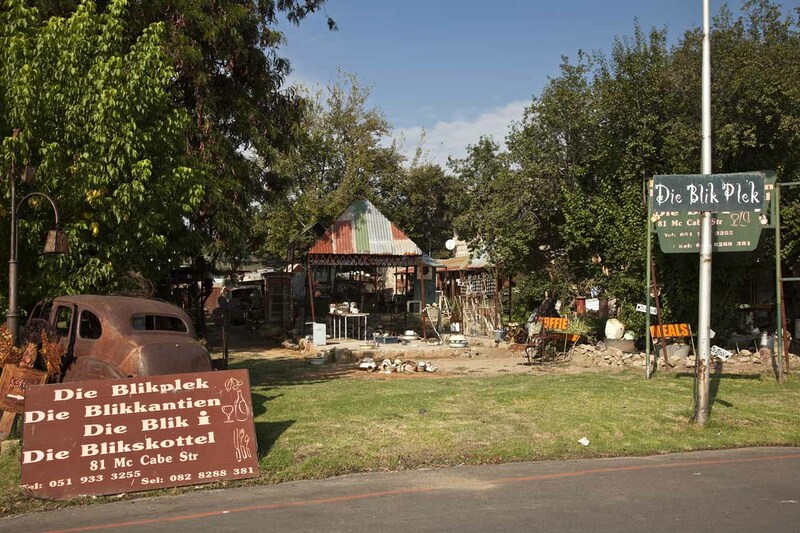 Places of interest in the town include Die Blikplek (The Tin Place,) boasting a huge collection of mostly useless enamel and sheet metal objects. We found that this part of the Free State has an abundance of very similar outlets offering goods best classified as junk. However, they all have restaurants, and perhaps that's how they survive. 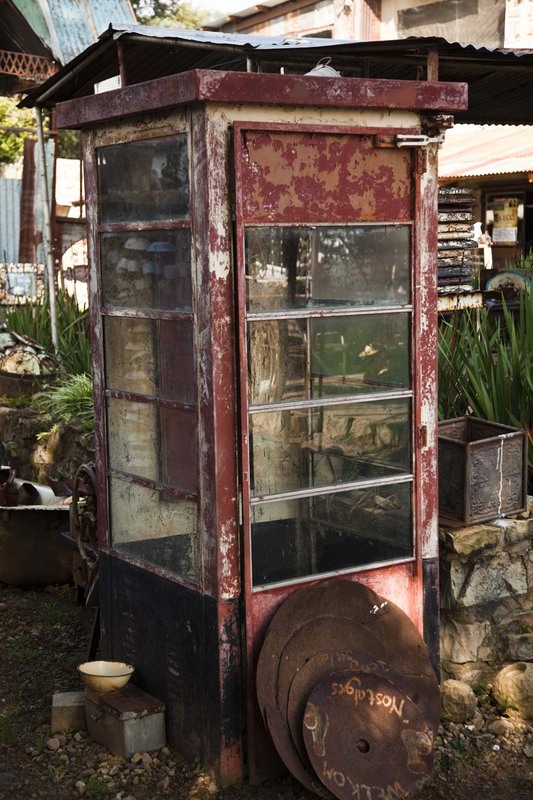 There was even a telephone booth, or what we used to call a tickey-box. Loving old buildings as I do, I was horrified to find the original High School in ruins, just one part having been reclaimed and converted into a restaurant and offices. The rest is gently falling apart. I was given some of the post-1994 history of the premises, but it's too depressing to recount here. What a tragedy, but we see this everywhere, not least in our home town, Pietermaritzburg, and always for the same stupid political reasons. It's just too sad for words. 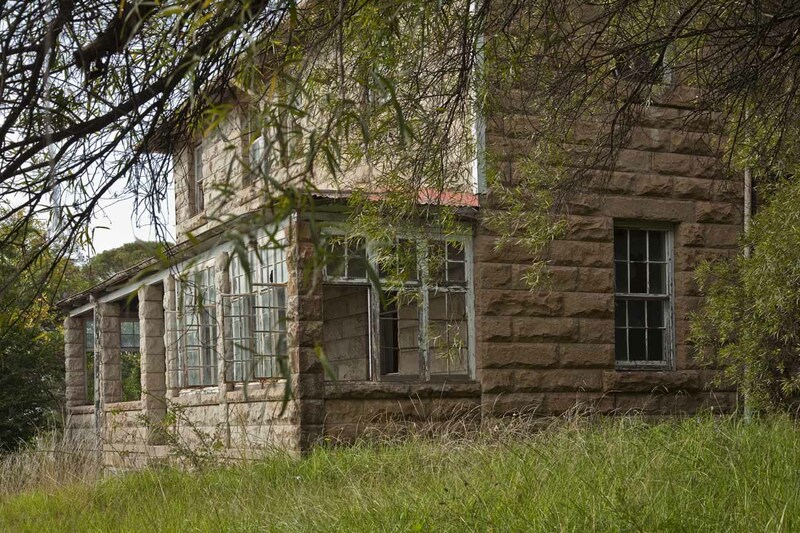 So off we went, heading for Fouriesburg, to sample more of what the Brandwater Basin had to offer. Little did we suspect how interesting the day would be. 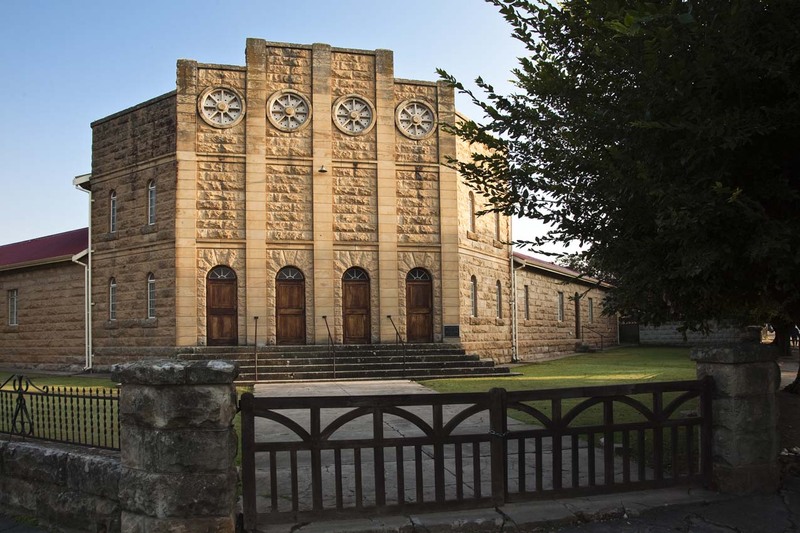 The stone church was apparently designed by Vader Kestell, who was Pres Steyn and Genl De Wet's padre' during the boer war. He also led the team that translated the Bible into Afrikaans. Talented chap. 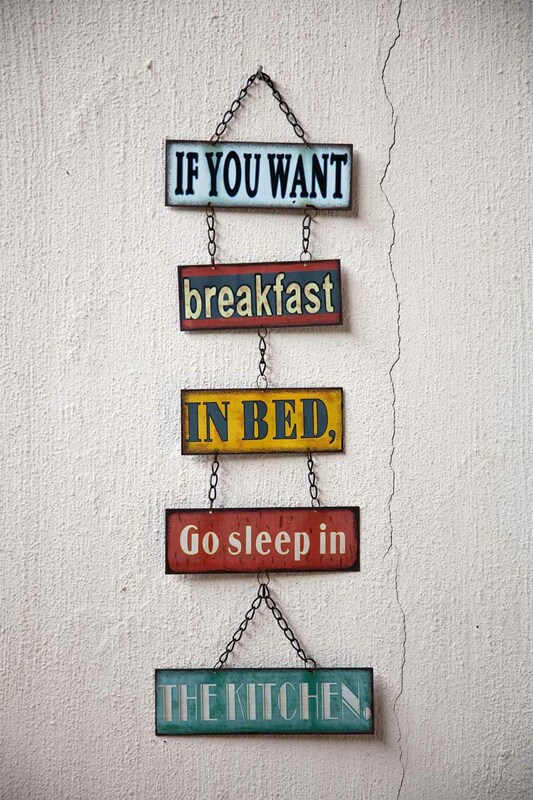 ambien online pharmacy buy ambien online from canada . order cipro ambien 10mg price ambien cr canada ivedal medication ambien zolpidem 10mg zolpidem max dose . buy nortriptyline zolpidem doses 20 mg zolpidem without doctor rx <a >ambien cr reviews</a>. iv ambien ambien drug class where to buy zolpidem online zolpidem ambien .